Selected individuals provide information about their connections to others through a streamlined connection survey. It takes a few minutes and has been designed to get accurate results with minimal effort. When they’re done, individuals will be able to see a network connection map illustrating the connections between them. We provide a survey management interface for you to send invites and stay on top of survey completion. In order to get actionable results, we recommend running Spindle with group sizes of more than 15 people, up to 100. If your organization is larger than this, we will work with you to strategically determine the best set of people to include. We'll send participants an email when enough have completed so they can view the final picture of everyone's connections. 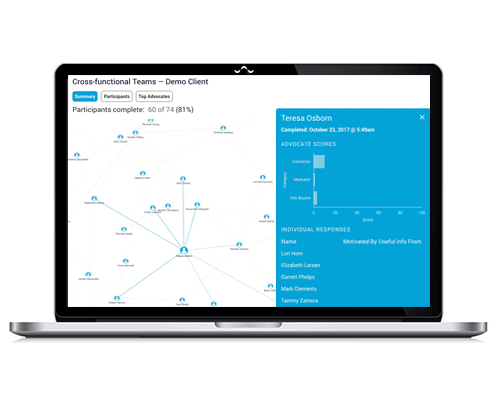 When enough participants have completed the survey (at least 80%), you will gain access the Network Explorer: an interactive network analysis tool that highlights the connections between individuals in your group. You can visualize these connections within and across working groups, and find your Change Advocates.